When cared for properly, dwarf cherry trees can provide you with an abundance of fruit, while giving your lawn or garden an extra source of beauty. Cherry trees offer beautiful plumes of cherry blossoms and when bearing fruit, the red cherries against the dark green foliage makes quiet a show. To keep your dwarf cherry tree healthy and always looking its best, you'll need to prune it correctly. Prune the cherry trees in late winter while the tree is in dormancy. Doing so will promote fuller, thicker growth in the upcoming growing season. Clean sharp pruning shears and garden loppers with rubbing alcohol before and after pruning each cherry tree. Use a clean cloth to thoroughly wipe down the blades with the alcohol to prevent the spread of fungus and disease from one tree to another. Prune the lower extremities of the cherry tree first. Cut back each branch 3 to 4 inches, giving the tree an even, round shape. Use sharp pruning shears for the thinner branches. Use a stepladder to reach the center and upper portions of the cherry tree. Use garden loppers to cut back larger and/or higher limbs of the cherry tree. Remove any suckers from around the base of the cherry tree. Suckers are the small shoots that grow from the main trunk or the ground around the base of the cherry tree. Use pruning shears to snip them completely away from the tree or snip them off level with the ground. Clear all of the clippings from the ground below the cherry tree; leaving the clippings, can easily kill grass and any underlying plants. Ideally, the branches of the cherry tree should be perpendicular to the main trunk. Tying branches in the perpendicular position may be necessary to achieve this style of growth. Having a partner to help steady the ladder while you are pruning can be beneficial to your safety. Always use caution when climbing a ladder outdoors. Ensure all four legs of the ladder are sitting of level ground. Do not attempt to climb the tree to prune its branches--some branches may not be strong enough to support your weight. Doing so can result in injury or possibly death. Do not prune the cherry trees in the summer until the cherry tree has reached the size the ideal for you. 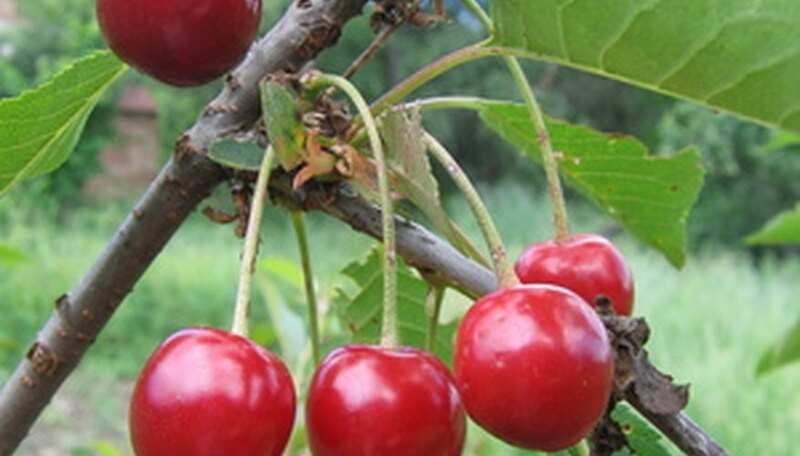 Pruning cherry trees in the summer will inhibit their growth. For best results, only prune the cherry tree in the winter.